In the decade after 1958, hundreds of thousands of Cubans left Cuba. Among those who exited were many highly skilled workers who had managed Cuba’s 161 sugar factories. Although the physical capi­tal left behind remained intact, the human capital embodied in each of the emigrants was lost to the Cuban sugar industry forever. Revolutionary leaders found it easy to label those who left as gusanos, without whom Cuba would be better off. By the 1970s Cuban government leaders had recognized the loss implicit in the emigration of so many skilled workers, but continued to view the economic value of factory managers as somewhat sus­pect, as if the managers were getting away with some­thing by being administrators. Cuba’s transition to socialism and its brief period of relatively free post-revolutionary emigration offers a unique opportunity to gauge the impact of a loss of human capital on industrial productivity. Cuba is an unusually rich laboratory for serious research on in­dustrial managerial productivity because there are few countries that have had revolutions, periods of free emigration, and adequate data on industrial management and performance at the factory level of a major industry. The exodus of over 90% of Cuban sugar factory managers within a decade of the revolu­tion set the stage for a very large scale “natural” ex­periment on the value of retaining experienced man­agers. If postrevolutionary sugar factories that retained ex­perienced managers operated significantly more efficiently than those that lost all their pre-revolutionary managers, then it can be concluded that managerial experience does have measurable value. In this study it is found that those mills that had pre-revolutionary managerial “holdovers” operated more efficiently than those that lost all experienced managers. The implication is that by losing managerial talent in the sugar mills Cuba suffered a massive capital disinvest­ment that hobbled economic development in the ear­ly stages of Transition I—the transition from capi­talism to socialism. Now, as Cuba is poised for Transition II—the transition from socialism to marketism (if not capitalism), a crucial question is will the Transition II leadership make the same mistake by driving out the old managers who are tainted by service to the old regime? If human capital is defined as the “stock of skills and productive knowledge embodied in people” (Eatwell, 1987, p. 682), then management could be viewed as a specialized form of human capital that could be de­fined as the stock of experience in how to organize production to achieve predictable outcomes. While many human capital studies have focused on the val­ue of formal education and systematic on-the-job training, Arrow has identified ordinary experience on the job, learning by doing, as a significant contributer to productivity (Arrow, 1962). The value of that kind of experience has been empirically measured by Lazonick and Brush, Lundberg, and others, and is known as the Horndal effect (Lazonick and Brush, 1985). In most studies of the Horndal effect, stable enter­prises with no significant changes in personnel, tech­nology or capital are compared to others that make significant changes. Factories that are left alone and whose owners do not “invest” in greater productivity, are found to have annual rates of labor productivity growth on the order of two percent. Somehow, with­out new investment or radical restructuring, workers and managers find ways to do their jobs better, even if left alone. Usually, with Horndal and human capi­tal studies, researchers are comparing baseline pro­ductivity of factories to which no physical capital has been added to others with greater rates of productivi­ty growth stemming from changes in either the hu­man or inanimate capital stock. What makes a study of Cuban sugar factories different is that all factories suffered a massive loss of human capital between 1958 and 1968. Thus, mills that lost every manager in a decade are being compared to others that re­tained a few of their experienced managers. When managers exit an enterprise, they take with them their embodied skills, knowledge, and experi­ence. Most organizations are “learning organiza­tions,” in that skills are accumulated as personnel gain more experience in organizing and executing production. At the margin, managers and workers continually learn to make improvements to solve problems like “tramp iron” in the cane feed stream (Germinsky, 1989). Perversely, Cuba’s sugar facto­ries became “unlearning organizations,” between 1958 and 1968, as managers and other workers joined the exodus that would decimate Cuba’s popu­lation. This initial exodus over-represented the professional, managerial, and middle classes, 31 percent, as well as the clerical and sales workers, 33 percent. Likewise, the educational level of these refugees was remarkably high. Of Cuban men who came to the United States from 1960 and 1964, about 64% had “managerial, … pro­fessional, technical, sales, or administrative” occupa­tional classifications, while between 1965 and 1971 about 45% declared “middle class” job status. Female Cuban émigrés also had high numbers in the “white collar” and technical categories. (Pedraza, 1995 p. 325). Although the aggregate effect of Cuba’s loss of mana­gerial and entrepreneurial capital and the “… conse­quent loss of productive and investment capabilities (Sanguinetty 1995, p. 22)” is very great, it is very dif­ficult to quantify. For most of the migrants, the data do not exist that would tell how their choice to exit Cuba affected productivity, costs, and performance in the enterprises they left behind. Fortunately, in the case of Cuba’s sugar factories, there are data that allow us to infer the negative impact of losing man­agers by detecting the positive effect reaped from the few managers who had not left by 1966. Researchers of the Cuban economy, both inside and outside Cuba, are afflicted with a paucity of good da­ta. The sugar industry is no exception, as the Cuban government routinely suppresses release of operating data that are commonly available for sugar factories in most of the world. Fortunately, in 1972, the Cu­ban government released Manual Azucarero de Cuba 1971 for the first time since its general publica­tion was discontinued in 1963. The Manual Azucar-ero de Cuba, 1971 published data for the 1966 and 1967 zafras, mill by mill, allowing comparison to the prerevolutionary operating experience of individual factories. For this study, the Cuban 1966 and 1967 data were compared to the prerevolutionary years of 1956 and 1957. Factory “mastheads” from the 1958 Gilmore Manual Azucarero de Cuba (Meyers, 1958) were compared to factory mastheads from the 1971 Manual to draw conclusions on the magnitude of the exodus and to discover any obvious changes in facto­ry management. Changes in management titles were noted and a count was made of how many managers from 1957 were still working in each factory in 1967. A striking result of the examination of factory mast­heads was the absence of “executive” personnel in the revolutionary period. Consistent with the belief of the early revolutionary politicians that top-level man­agers were parasites, most top executive positions were eliminated. Thus, all executive and financial managerial positions (Personal Ejecutivo) listed in pre-revolutionary factory rosters were absent in 1967. For example, Table 1 shows the preand post­revolutionary positions listed for the small pre-revo­lutionary factory, Elena (Juan M.Quijano). Table 1 reflects the socialist take-over of the factory in that all the executive positions were eliminated, leaving only the administrative positions (Personal de Adminis-tración). It can also be seen that of the nine managers working at Elena before the revolution, only two, Réne D. Duque Acevedo and Manuel Prego, were still there in 1967, when the mill became known as Juan M. Quijano. For all Cuba’s sugar factories only 69 managers from the pre-revolutionary era re­mained as managers in 1967. The magnitude of “Transition I” can be assessed by considering that, of the approximately 2000 named pre-revolutionary ex­ecutives and administrators, only about 70 remained after a decade of revolution. Steady operation is the critical factor in maintaining steam usage efficiency. A reliable cane supply must be available so that the processing rate, once set, can be held with minimum fluctuation. A stop-and-go situa­tion means excess and shortage of steam. Lost time was predicted in a model using the number of managers retained, factory size (measured as daily cane grinding capacity), lost time in a pre-revolution­ary year, grinding days in a pre-revolutionary year, and grinding days in the year for which the lost time was being measured. The rationale for including pre­revolutionary lost time as an independent variable was to capture geographic and mill idiosyncracies that would have nothing to do with the number of managers lost or retained. For the same reason, pre­revolutionary grinding days were included in the model. Results from the regression analysis can be seen in the equation at the bottom of the next page for the 147 mills for which all the necessary data were available. The model reveals that for each experienced pre-rev­olutionary manager retained, a sugar factory could expect to have a 1.5 percentage point reduction in lost time. Although extrapolation is somewhat tenu­ous, for the average mill that lost about ten managers, the imputed increase in lost time from a failure to re­tain experienced managers is on the order of magni­tude of fifteen percentage points. The implicitly higher production costs associated with that excess lost time would have made many mills produce sugar at unit costs above the prices at which the sugar could be sold (even at preferential prices). Another interesting feature of the model is the high tolerance values. Tolerance is the percentage of the variation in an independent variable that cannot be “explained” by variation in all of the other indepen­dent variables. With the simplest interpretation, the high tolerance values tell us that there is no serious multicollinearity in the model. The high tolerance value on HOLD shows that the number of managers who stayed had nothing to do with the size of the factory, how long the harvest was before or after the revolution, or how much lost time was characteristic at that mill before the revolution. Thus, it cannot be said either that only the weaker or the stronger of the managers left Cuba between 1957 and 1967. The high tolerance values on prerevolutionary lost time and mill capacity show that size of factory was not re­lated to lost time before the revolution, but the sig­nificance of the capacity variable in the model shows that size was related to lost time in Transition I. Since the tolerance values are high for DAG56 and DAGOO, it is clear that with almost identical physical capital in 1966 as in 1956, there was no correlation between days of operation in the two years. The real­ity behind that curious result must have given sugar industry managers many somber thoughts as they prepared to attempt a ten million ton harvest in 1970. A number of conclusions can be derived from the analysis of the factory data before and under the Cu­ban revolution. The Cuban Revolution “caused” increases in lost time in the sugar factories. In the aggregate, lost time in 1966-67 was 10.6 percentage points higher than lost time in 1956-57. Although some of that excess lost time must have been caused by parts and fuel shortages, political tur­bulence, and misguided economic policy, much of it can be attributed to the loss of experienced managers. Mills with greater lost time before the revolution were likely also to have greater than average lost time eight years into the revolution. Retention did not vary significantly from prov­ince to province. Separation of the data by prov­ince showed that the holdovers were distributed evenly across all provinces. Retention did not vary significantly by size of mill. Managers of small sugar factories were no more or less likely to stay in Cuba than their counterparts in the huge mills. While mill capacity did not correlate with lost time before the revolution, it did after the revo­lution. Larger factories had disproportionately more lost time after the revolution. Losses to the Cuban economy from emigration of managers and technicians were significant. Individual managers’ productivity was signifi­cant enough to be detectable, measurable, and significant. One of the most persistent problems in Cuba’s revo­lutionary sugar factories has been the chronic under-performance of the largest sugar factories. Over three revolutionary decades there have been frequent com­plaints in the Cuban press about the poor perfor­mance of the largest mills ranging in size from about 7,000 metric tons of daily capacity at Héctor Molina Riano (Gómez Mena) and Grito de Yara to the relative giants above 10,000 tons like Brasil (Jaronú) and An­tonio Guiteras (Delicias). Cuba’s smallest mills in the provinces of La Habana, Pinar del Río, Matanzas, Villa Clara, Granma, Guantánamo, and Cienfuegos were the subjects of very few complaints over the revolutionary years. A study of the 1984 harvest cam­paign found that the largest mills were over-repre­sented in published lists of poorly performing mills and that the smallest mills were over-represented in published lists of the best performing sugar mills (Radell, 1987). The pattern of systemic problems with larger sugar factories persisted into the eve of the collapse of the CMEA. Table 2 shows results from lists of 10 best and 10 worst factories reported in the newspaper, Granma. Average capacities of mills on the lists were computed and a t-test was done on the differences of mean values. Table 2 shows the probabilities that the differences in mill capacities, on the order of 4500 metric tons for the year (September 17, 1991 entry), were random. A study by the author (not used here) did the same analysis for Louisiana sugar factories and found no systematic difference between the in­dustry leaders and the industry laggards. For Cuba it can be asserted with better than 99% certainty that the larger mills have performed more poorly than the smaller mills. Persistent inferior performance of larger mills is a Transition II management issue because in the tran­sition period resources cannot be directed equally to all sugar factories if optimal results are expected. It would be tempting to close down most of the small­est sugar factories under the assumption that these mills are sub-optimal by international standards (Alonso and Lago, 1993, p. 180). While scaling up or closing sub-optimal plants must be part of the long range planning for Transition II, that will work better after five to seven years of stabilization of the industry. The problem with the strategy of closing sub-optimal mills early in Transition II is that, al­though outside Cuba the smallest mills tend to have the highest unit costs, in today’s Cuba, the smallest mills are likely to have the lowest unit costs. That condition will persist well into Transition II and must be planned for. A strategy that closes the smallest mills using international economies of scale argu­ments will not succeed in reducing Cuba’s aggregate sugar production unit costs until the later stages of Transition II. The reasons why Cuba cannot quickly approach in­ternational sugar factory sizes have much to do with the nature of the revolutionary economic system. Under socialism, Cuban managers were forced to re­spond to many constraints that distorted their own resource allocation decisions. To respond to the fixed input allocations characteristic of socialism without the variable price structure characteristic of capital­ism, Cuban factory managers had to get very good at managing shortages, lacks, gaps, and (ironically) sur­pluses of some inputs. The fixed price system created strong incentives for employees to misappropriate factory property and this situation also had to be managed. The broad statement of Sanguinetty (1995, p. 22) that “the more centralized the govern­ment is, the worse the information glut it creates and the more serious become the deviations from a mar­ket system,” applies precisely to the Cuban sugar in­dustry. The information required and resources available were just barely adequate to keep small sug­ar factories operating efficiently. Managers of the smallest mills needed to be able to work around myr­iad irrational allocation errors and surprises. The small sizes of their mills made it possible for them to manage the logistical nightmare that is a zafra with­out abundant resource inputs. The managers of large factories had no chance to practice the craft of “good” management. For them, the best that could be done was to mitigate the ineffi­ciency. For large factories under socialism, the nor­mal symbiotic link between agricultural and industri­al operations turned against efficient operation. When that link between field and factory is poorly managed and coordinated, the basis for “…general efficiency of the agro-industrial activity” is eroded (Alvarez and Peña Castellanos, 1995, p. 361). Large mills must use cane cut farther from the mill to oper­ate and must, therefore, have more investment in transportation infrastructure to operate efficiently. At any point after the beginning of the harvest, a large mill will have more cane in transit than will a smaller mill. Since cane loses usable sugar content as soon as it is cut or burned, more transit time means more re­coverable sugar is lost before the cane ever arrives at the mill. Processing old cane means less crystalline sugar and more invert sugars and molasses. To man­age a harvest with a minimum of lost time in a large Cuban sugar factory would have required a mix of cane varieties not available, planted in a cycle that was not feasible, harvested on a time schedule that could not be met, and delivered to the mill in a steady flow just sufficient to operate the plant at its rated hourly capacity. Managers of large factories in Cuba did not have sufficient logistical infrastructure to make their processing problems soluble under the existing economic structure. Florida sugar factories can only be efficient at their very large size by having sufficient infrastructure to run the field and factory operations in strict lock­step. To duplicate the degree of planning built into the huge Florida sugar factories like Clewiston, Bry­ant, and Okeelanta, Cuba’s factories will have to op­erate with a longer time horizon. Since optimum per­formance requires that future cane planting, gestation, ratooning, harvesting and processing must be planned with a long view of five years or more, Transition II will be an extraordinarily long process for larger mills. While the large mills are getting back to rational operations, it may be wise to put the early emphasis on the smaller mills. Eventually, those smaller mills will be combined with other mills or phased out. But during transition, the best course may be to stabilize the industry first among the small and then later among the large mills. When Transi­tion II begins, the experienced small mill managers will be able to solve production problems with more modest increments in inputs. Managers of large mills will also have good ideas of reasonable Transition II paths, but those paths will be more expensive and will require the Cuban people to wait longer before there are any tangible results. Revolution during Transition I radically altered the fundamental industrial structure of the Cuban sugar industry. That restructuring can be visualized by comparing three-dimensional wireframe models fit­ted to data on lost time, factory size, and grinding days for the years 1956 and 1966. In a sense the visu­al models are “industry prints” analogous to finger prints that identify individuals. Industry prints for successive years for the same industry usually have similar patterns. Stochastic shocks to the industry will distort the pattern visibly and offer clues as to how the managers adjusted their operations to adapt to the shock. Figure 1 shows a characteristic prerevolutionary pat­tern for the year 1956, using a wireframe fitted to ac­tual Cuban data by the distance-weighted scatterplot smoothing technique. Most mills cluster between 60 and 110 grinding days, with mill sizes between 1800 and 8000 metric tons of daily capacity, and with lost time between 2 and 12 percent. The flat open pat­tern over most of the geometric figure indicates that large mills did not tend to do worse than smaller mills and that mills could operate within a broad range of operating days without experiencing excessive lost time. Figure 2 shows how radically different the situation was in 1966, after years of revolution and neglect of the sugar industry. The smallest factories clearly did better and the large mills did visibly worse. Although a trough of relatively superior performance for each size class can be seen between 50 and 100 days, no mill with capacity greater than 8000 tons did better than the worst mill with capacity of less than 3000 tons. Moreover, the 5 percent lost time that was typi­cal of mills before the revolution (Figure 1) was only achieved by some of the smallest mills after the revo­lution (Figure 2). Figure 3 represents the factories in 1967 that had lost all their managers. The wireframe has the same basic structure as the 1966 data for all mills (Figure 2), ex­cept that it has been fitted only to mills under 11,000 tons because results for one mill were missing in 1967. 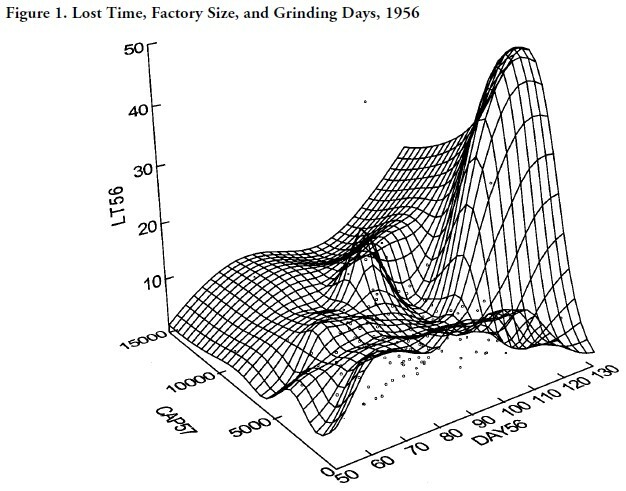 The pattern shows that lost time increased with mill size over a broad range of days of grinding. That implies that with all experienced managers gone, only the small mills were able to perform with acceptable levels of lost time. The general openness of the structure implies that, without any experi­enced managers, size of mill was a more important determinant of factory performance than was the number of grinding days. Figure 4 represents the factories in 1967 that retained some pre-revolutionary managers. 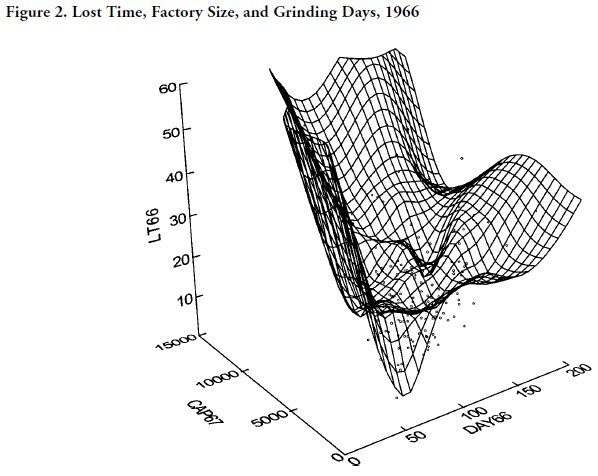 The cloud of small mills below the wireframe indicates that many small mills were doing well in ways that could not be ex­plained by variation in mill size and days of grinding. 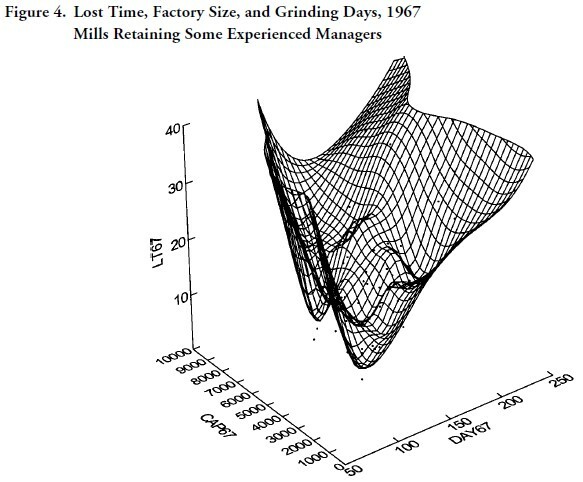 A deep, well-defined trough of optimality between about 90 and 150 days of grinding indicates that ex­perienced managers were able to reduce the “penalty” on large mill performance. What were experienced managers doing in 1967 that their less experienced counterparts were not doing? Comparing Figures 3 and 4, it is clear that experi­enced managers knew better what day operations should begin on and did a better job of coordinating the agricultural and industrial operations. Although Figures 3 and 4 offer no proof, it is likely that mills with experienced managers did not have the flat pat­tern of pre-revolutionary Cuban mills because politi­cians did not allow managers of the revolutionary pe­riod to set a terminal date on the harvest. A rule of thumb in the international sugar industry is that grinding should begin on the first day that the marginal cost of produced sugar drops below the an­ticipated price, and should continue until the last day before marginal cost rises above price (Guise and Ry­land, 1969). The logic behind the algorithm is that beginning too early has the mill grinding cane with too low a sugar content, while continuing too late in the season has the mill grinding cane with too great a content of invert sugars. Either grinding too early or too late will increase the unit cost of the high-value crystalline sugar that is the primary output. When politicians decide how much cane will be planted and cut, even experienced managers will have trouble avoiding poor mill performance. 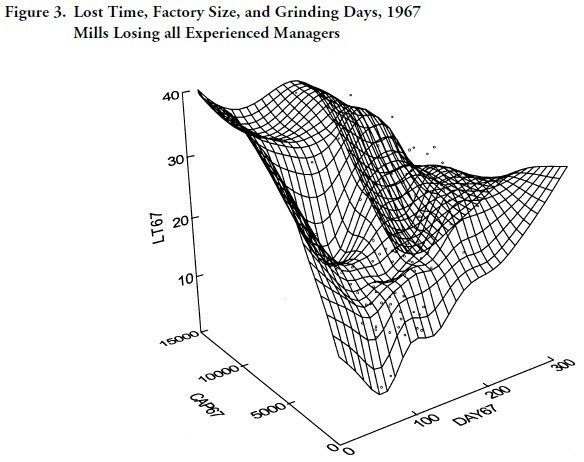 Figure 4 indicates that experienced managers avoided the tendency for large mills to do worse than smaller mills under a socialist regime by more carefully controlling the be­ginning and end of the harvest. Small mills could more easily be “engineered” to operate well—large mills at the center of more complex enterprises re­quired more experienced judgment to accompany the “engineering.” Even though Cuban policy of the mid-1960s viewed marginal cost as a capitalist arti­fact irrelevant to socialist production, the experi­enced managers must have had marginal costs in mind when they planned the harvests. Contrasting Figure 4 to Figures 1 and 3, graphically shows that one of the biggest penalties Cuba paid for forcing its factory managers out of the country was the tendency for larger mills to do worse than smaller mills. The success of Transition II will, in part, be depen­dent on avoiding the mistakes of Transition I. Among the biggest mistakes that the emerging Cu­ban leadership could make would be hostility toward the managers who are now operating Cuba’s sugar factories. Associating the existing managers with so­cialism and encouraging them to seek other employ­ment will delay successful transition and increase transition costs by impairing efficiency. A listing of some of the mistakes in Cuba’s last transition should point the new Cuban leaders away from policies that caused the extraordinarily high loss of experienced managers in the early years of Transition I. Financial and executive management positions were eliminated. Value of management was disparaged. Managers were viewed as parasites (Mesa-Lago, 1971, p. 513). Managers were viewed as getting away with something in their comfortable offices. Transition I politicians believed that only the masses toiled and did “real” work. Management pay differentials were eliminated in the name of equity (Mesa-Lago, 1981, p. 150). All pay scales were compressed. “In some cases, managers earned less than unskilled subordi­nates” (Roca, 1986, p. 165). The principle of unity of command was under­mined as politicians made economic decisions (Bernardo, 1971, pp. 202-204). Roca’s wonder­ful description of this was “microeconomic intromission” (Roca, 1986, p. 174). Costs, prices, and money were disparaged as cap­italist artifacts (Roca, 1981, p. 87). Monetary incentives were disparaged. Moral in­centives were believed to yield better results than monetary rewards. The sugar industry was viewed as suspect because of its association with hard and seasonal work, slavery, and exploitation (sucraphobia) (Pérez-López, 1991, p. 75). Sugar factories were used as employment provid­ers rather than as economic organizations. The result, according to Fidel Castro (1973) was that “ if we asked a lot of sugar mill workers how many workers there were in the mill under capi­talism and how many there are now, it could be demonstrated that we use many more men than the capitalists, to run the mills less efficiently than the capitalists” (Hagelberg, 1974, p. 161). This practice has continued to the present day (Blanco, 1996, p. 259). Viewed as “dead wood” compared to politically correct revolutionaries, experienced manager-swere expected to become politicians (Guevara in Tablada, 1989, p. 213). Che Guevara’s system of budgetary finance and its successors subjected managers to accountabil­ity without authority to make decisions (Roca, 1986, p. 160). Che Guevara’s consolidado system eliminated en­terprise autonomy, substituting national man­agement for local management (Brunner, 1977, p. 31; Edquist, 1985, p. 31; Guevara in Tablada, 1989, p. 114). Political operatives were given jobs that required technical and managerial skill without consulta­tion with managers. That practice continues in Cuba (Catañeda and Montalván, 1994, p. 192). Mesa-Lago uses the phrase “replacing techno­crats with loyal but incompetent revolutionaries” (Mesa-Lago, 1981, pp. 29, 35). See also Bernar­do, 1971, pp. 202-204. Repression made “voice” to improve factory practice a more costly path than “exit” (Hir­schman, 1970, p. 40). Auty (1972, p. 12) suggests that “… differences in managerial ability …[are] …responsible for sizeable differences in costs” in the sugar industry. The ample evidence of the worth of competent, experienced management should guide Transition II Cuba to re­form radically the training, evaluation, compensa­tion, and retention of managers. Ahlfeld, Helmut, ed., F. O. Lichts World Sugar Sweet­ener Yearbook 1990, Ratzeburg, F. O. Licht, 1990. Alonso, José F. and Lago, Armando. “A First Ap­proximation of the Foreign Assistance Require­ments of a Democratic Cuba,” Cuba In Transition—Volume 3, Washington, ASCE, 1993, pp. 168-219. Alvarez, José and Peña Castellanos, Lázaro, “The Transformation of the State Extensive Growth Model in Cuba’s Sugarcane Agriculture,” Cuba In Transition—Volume 5, Washington, ASCE, 1995, pp. 348-362. Arrow, Kenneth, “The Economics of Learning By Doing,” Review of Economic Studies, Vol. 29 (1962), pp. 155-173. Auty, R. M., “The Sugar Industry of Demarara, 1930-65: Some Problems in Identifying Scale Economies,” Journal of Tropical Geography, 34 (June 1972). Bernardo, Roberto M., “Managing and Financing the Firm,” in Revolutionary Change in Cuba, Carmelo Mesa-Lago editor, University of Pitts­burgh Press, 1971. Blanco, Alfredo. “The 1995-1996 Sugar Zafra: Re­sults and Implications—The Machinery Sec­tor,” In Cuba in Transition—Volume 6, Wash­ington, ASCE, 1996, pp. 253-259. Brunner, Heinrich Cuban Sugar Policy from 1963 to 1970, Pittsburgh, University of Pittsburgh Press, 1977. Catañeda, Rolando H. and Montalván, George Plin­io, ”Cuba 1990-1994: Political Intransigence versus Economic Reform,” in Cuba In Transition—Volume 4, Washington, ASCE, 1994, pp. 181-208. Eatwell, John, ed. The New Palgrave: A Dictionary of Economics, New York, Stockton Press, 1987. Edquist, Charles, Capitalism, Socialism, and Technol­ogy: a Comparative Study of Cuba and Jamaica, London, Zed Books, 1985. Germinsky, Robert A., “Louisiana Cane Mill Solves Tramp Iron Problem,” Sugar y Azúcar (June 1989). Guevara, Ernesto “Che,” quoted in Carlos Tablada, Economics and Politics in the Transition to Social­ism, Sydney, Pathfinder, 1989. Guise, J. W. B. and Ryland, G. J. “Production Scheduling and Allocation: A Normative Deci­sion Model for Sugar Milling,” Australian Jour­nal of Agricultural Economics, (June 1969), pp. 8­25. Hagelberg, G. B., The Caribbean Sugar Industries, Antilles Research Program, Yale University, 1974. Hirschman, A. O., Exit, Voice, and Loyalty: Responses to Decline in Firms, Organizations and States, Cambridge, Harvard University Press, 1970. Lazonick, William and Brush, Thomas, “The ‘Horn-dal Effect’ in Early U.S. Manufacturing,” Explo­rations In Economic History, 22 (1985), pp. 53­96. Mesa-Lago, Carmelo, “Present and Future of the Revolution” in Revolutionary Change in Cuba, Mesa-Lago, ed., University of Pittsburgh Press, 1971. Mesa-Lago, Carmelo, The Economy of Socialist Cuba, Albuquerque, University of New Mexico Press, 1981. Meyers, Fred I., ed., The Gilmore Manual Azucarero De Cuba 1958, New Orleans, 1958. Ministerio de la Industria Azucarera (MINAZ), Manual Azucarero De Cuba 1971, La Habana, Instituto Cubano del Libro, 1972. Payne, John Howard. Unit Operations in Cane Sugar Production, New York, Elsevier Scientific Pub­lishing Company, 1982. Pérez-López, Jorge. Sugar and the Cuban Economy: An Assessment. Research Institute for Cuban Studies, University of Miami, 1987. Pérez-López, Jorge. The Economics of Cuban Sugar, Pittsburgh, University of Pittsburgh Press, 1991. Radell, Willard W. “Comparative Performance of Large Cuban Sugar Factories in the 1984 ‘Zafra’,” Cuban Studies, volume 17 (1987), pp. 141-155. Roca, Sergio, “Cuban Economic Policy in the 1970s: The Trodden Paths,” in Irving L. Horowitz, ed. Cuban Communism, 4th edition, New Brun­swick, Transaction Books, 1981. Roca, Sergio, “State Enterprises in Cuba Under the New System of Planning and Management (SDPE),” Cuban Studies, volume 16 (1986). Romeu, Jorge Luis, “More on the Statistical Com­parison of Cuban Socioeconomic Develop­ment,” Cuba In Transition—Volume 5, Wash­ington, ASCE, 1995, pp. 293-301. Sanguinetty, Jorge A., “Evaluation of Changes in Economic Policy in Cuba,” Cuba In Transition —Volume 5, Washington, ASCE, 1995, pp. 21­23.